K9s for Warriors. Seeing Eye Dogs for the Mind. By Anna Cooke for The New Barker Dog Magazine. How deep into a soul does one have to dig to find the strength to help someone else who is standing at the edge of their life? Especially knowing that the life you are about to help has been affected, almost to the brink, by the ravages of war? Shari Duval was a volunteer for the Wounded Warrior Project out of Jacksonville, and saw firsthand the number of young men and women coming home from their tour of duty with an invisible disorder, Post Traumatic Stress Disorder or PTSD. And yet, when her son Brett, a Veteran K9 Police Officer and contractor for the Department of the Army, returned home after serving two tours in Iraq, she honestly did not know what was wrong with him. He was withdrawn, isolating himself from family and friends. As a bomb dog handler, Shari knew he had been in dangerous and deadly situations, but he was a veteran police officer, she thought to herself. “It just never dawned on me that these were signs of PTSD as a result of what he had seen in Iraq,” she said. Thankfully, the family had the financial ability to get Brett the help he needed. During his treatment, Shari began heavily researching PTSD, and discovered the success in treating the disease through the use of service dogs. With the blessings and support from the Wounded Warriors Project, Shari created K9s for Warriors, a non-profit organization in Ponte Vedra Beach to train and provide service canines to military personnel suffering from PTSD. “They are like seeing eye dogs for the mind,” she said. Oscar, a Marine, with his K9s for Warriors dog, Courage. Photograph by Heidi Joy Howard for The New Barker Dog Magazine. Since September 11, 2001, this country has produced 500,000 disabled warriors, and of that number, one in five is diagnosed with PTSD. One in six of those diagnosed will attempt or commit suicide. That’s over 16,000 suicides, alarming proof that war can and does cause severe brain damage. Symptoms of the disease include hostility, aggression, depression, paranoia, acrophobia, nightmares, panic attacks, poor coping skills, memory loss and lack of trust. Studies have proven that there are actual physical changes in the hippocampus and prefrontal cortex of the brain as a result of a horrific experience someone has endured, like the effects of war. 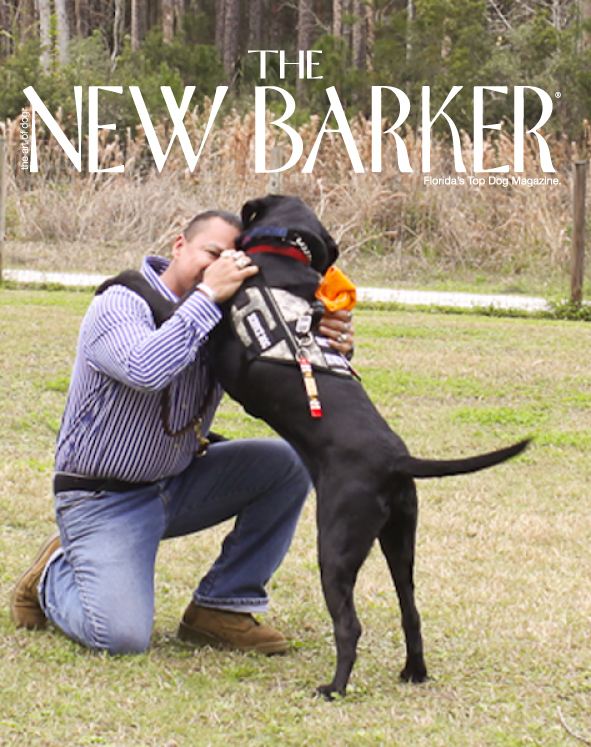 Service canines have been medically proven to aid in the recovery of warriors suffering from PTSD. The dogs are recognized by the United States Department of Justice Civil Rights Division, and qualify under the American Disability Act of 1990. “With this information, I just knew we were on to something, and wondered how many thousands more we could help through our program,” said Shari. All of the dogs in the K9s for Warriors program are either adopted from shelters or rescue groups, or gifted by concerned citizens. Most of the dogs are mixes, with either Labrador or Golden Retriever in them. Each dog undergoes a series of tests to ensure they are not skittish, aggressive or shy. They must get along with children and other animals, and not be adversely affected by loud noises. The evaluation process is pretty standard, and is overseen by Shari’s son Brett who is now Director of K9 Operations, and Sherrie Keshner, Coordinator of K9 Operations. All of the dogs accepted must be less than two years old to try and maximize the length of time the service animal has with the warrior. Right now, there are around 15 sources across the state that the organization works with. “The groups know what kind of dog we’re looking for, and when they see a dog who might fit our criteria, they’ll give us a call,” said Shari. Naturally, they are receiving calls every day. “There is just no reason for us to purchase a dog when there are dogs available to us who can qualify for a life of service work,” she added. During the three-week program, the warriors stay in living quarters on the K9s for Warriors campus, which also houses the dog kennels. In addition to the canine and housing, the program provides training, certification, equipment, seminars, vet care and most of the food. The food is actually donated and prepared by a group of local women, Kasseroles for K9s. “We find out what they like to eat, and these magnificent women cook delicious food for the warriors the entire time they are here,” said Shari. The scene when a new group of warriors arrives is usually the same. They come with duffel bags full of medication, and plenty of skepticism. They question the length of the program, and how the dogs are going to help them get better. They may complain about the prospect of having to get up out of bed to take the dog outside. “How the hell is that going to help me?” is often heard. Shari and her staff tell them the same thing every time: “Just give it a week.” Within 48 hours, the dog and warrior have bonded. The warriors are expected to be up by 7 a.m. Their job is to let the other dogs, not yet in the program, out for their morning constitutional, play, give them food and fresh water and clean out their kennels. Then the warriors sit down to their own breakfast. The day’s schedule is reviewed at that time. During the group training sessions, warriors learn the skills needed to train their own canines. After a group training session they break for lunch, then head out into the community with their dogs. “We do fun things so that the warriors won’t become bored, otherwise their minds will wander off to somewhere else. They love St. Augustine, and we are so fortunate to have such a dog friendly and scenic town nearby in which to train,” said Shari. K9s for Warriors accepts around 30 warriors for the Academy in a calendar year. “Our goal is to help these men and women return to civilian life with dignity and independence,” said Shari. They come from as far away as California and Oregon. One new applicant is coming from Hawaii. The only thing that K9s for Warriors cannot afford to provide at this time is transportation for the warriors to get to Ponte Vedra. “The Marines have a Semper Fi Fund, and they are the only branch of the military right now paying for a Marine’s travel expenses to get here,” said Shari. The dogs are service dogs, but Shari refers to them as medical equipment. During the program, the warriors are weaned off many of their drugs. “They get back to living instead of living in a fog. And the dogs, who are now they’re walking prescriptions, have helped bring them out of that fog,” said Shari. Here is how K9s for Warriors works. The dogs are crate trained, and remain so until they are matched with their warriors. At this point the dogs remain with their warriors within the living quarters. They are allowed to sleep with them, be by their side, never going back to their crates. They go on walks, and travel to places together in the car. The dogs now look at the warriors as the key to their newfound happiness and freedom. The next group of dogs is the one the current class is taking care of. They have a vested interest in them, wanting to know who was paired with which dog. The Canine Alumni Program at K9s for Warriors encourages alumni and new students to communicate with each other either about the program or the dogs. “There is a lot of social media correspondence,” said Shari who also encourages each applicant to contact one of the Academy’s alumni. For more information, please visit http://www.k9sForWarriors.org. Visit them on Facebook at http://www.Facebook.com/K9sForWarriors. You may also call them at 904.686.1956. WISH LIST: Concrete slab for outdoor kennels. Large Dog Crates and Carriers. Gift cards to area pet stores. Previous Previous post: Stellar Canine Athleticism in St. Petersburg, Florida. Next Next post: Your Dog Oughta Be In Pictures.